Glass igloo in Finland is a romantic hotel to enjoy the sky, Lapland scenery and the Northern lights. It is a little cabin built from insulated thermal glass / or log cabin with glass celling and panoramic view. 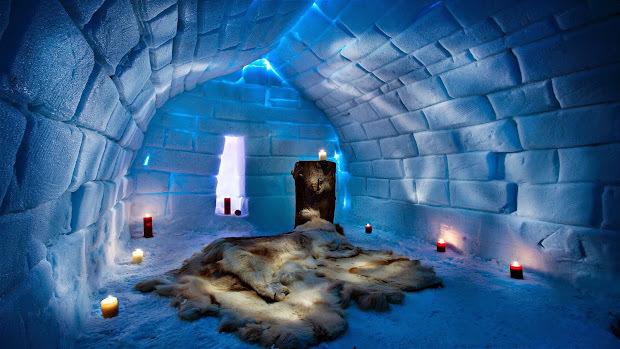 Igloos are electrically heated and keep warmth inside. At the beginning of 2019 there were more then 27 glass igloo hotels and resorts in Finland offering great opportunities to see the Northern Lights and enjoy all kind of Lapland and snow activities. Our TOP 5 glass igloo selection is based on few criteria: 1. Customer satisfaction (feedback from igloo guests, booking.com ratings, tripadvisor.com reviews, etc). Glass igloo hotel in Finland - Levi, open in 2019. Northern Lights Village Levi is the Northern Lights and Lapland activities focused resort. It offers Aurora accommodation, restaurant and wide range of activities: sauna, snowmobile track for children, toboggan hill, reindeer, huskies, Aurora Hunts. Our newly built Kelo-Glass igloos combine the comforting warmth of our cosy log chalets with the sensational views of our world-famous glass igloos. Sleeping up to six and featuring a private sauna, fireplace, kitchenette, and a bedroom with a stunning glass roof, they’re made from Lapland’s unique Kelo pinewood.